2019 6-3 Kyndall Golden (New Manchester) double-doubled in a loss with 13 points, 14 rebounds and 4 blocks. Golden is a lane clogger with her size and length. She is an average athlete that doesn’t try to do anything she’s not capable of. She did a great job of crashing the offensive glass and keeping rebounds high. She showed a lefty hook in the lane. 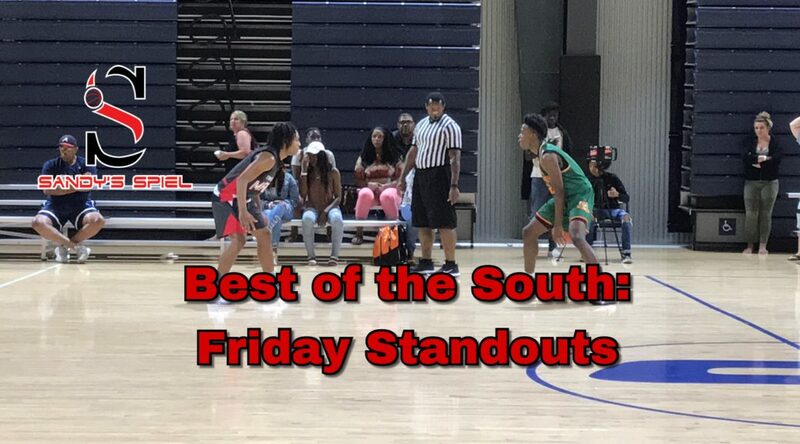 2019 5-10 F Jada Griffin (Northwest Whitfield) is more of a center during the high school season, but on the travel circuit she fits more as a slashing small forward or a quick power forward. Griffin brought great energy as she cleaned the boards and tried to get to the rim. She had 8 points, 9 rebounds and 1 assist. 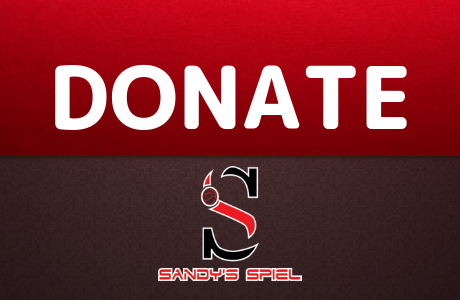 Her physical frame and quickness gives her value as a combo forward. She hit one jumper on the day and will need to continue to improve her outside shot. 2019 6-0 PF Taziha Fanning (Harris County) did her usual damage inside, hanging 19 points, 9 rebounds and 1 steal. Fanning, an All-State big, is a physical power post that uses her sturdy frame to move defenders out of her way. Fanning is a strong rebounder. She sticks with it even when she gets her shot blocked, on numerous occasions regathering herself and powering through for a bucket or a foul. She has decent footwork on the low block and knows what her strengths are. At the foul line her free throws are very flat. She shot 44% from the line as a junior. 2019 5-7 PG Kennedi Miller (McIntosh) didn’t score but she managed to keep the pressure on the defense with hard drives to the basket. After failing to convert at the rim on her first attempts, Miller made the smart decision to finish her rim runs with a dump off to her bigs on the block. Her ballhandling and her defense kept her on the court in a close game as she finished with 2 rebounds, 2 assists and 3 steals. 2019 6-0 SG Kai Carter (Paideia) looked good before going down with an ankle injury and having to get carried off the court. Carter is a long athletic guard that is best when slashing to the hoop. She had 8 points, 3 rebounds, 1 assist and 2 steals. She didn’t show it on Tuesday, but if she has a three-point shot in her arsenal, it wouldn’t be hard to see her attracting some serious D-I interest. 2019 5-10 SG Summer Dilwood (Tucker) is another good looking long perimeter player. She hit a three and finished with 7 points, 6 rebounds, 2 assists, 2 steals and 1 block. Her activity on defense shone through in a 50-43 loss to 16U Gauchos. 2019 6-1 C Kennedi Manning (Arabia Mountain) is a svelte agile post that has the length to block shots and clean up misses. She had 5 points, 9 rebounds and 3 blocks. She provided good effort in the paint but could be even more aggressive when trying to score inside. 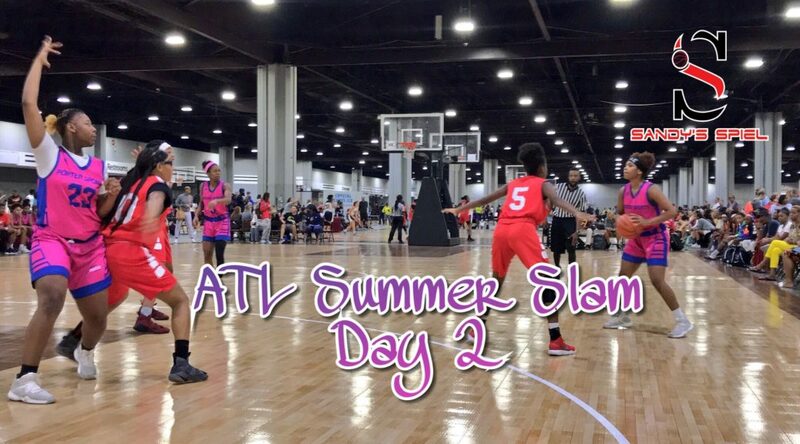 2021 6-4 C Jill Hollingshead (Holy Innocents’) responded in a big way on Day 2. After opening the tournament by floating around the three-point line, Hollingshead got in the paint and battled with Natalija Marshall. She tallied 12 points, 8 rebounds and 6 blocks. Hollingshead’s length gave the 6-foot-5 Marshall and the rest of Exodus some issues when getting in the paint. Hollingshead is still learning her craft and identifying mismatches will make her an even tougher cover once she matures. 2019 5-7 PG Alea Spears (Brookwood) was a bowling ball of competitiveness. She had a quiet Summer Slam opener but brought it on the big stage against two of the better guards in the event. Spears was good in transition pushing the ball down the floor. She played solid defense and hit shots on offense on her way to 12 points. Here compact build let her absorb contact and finish when getting to the hole. 2019 6-0 F Kierra Adams (Brookwood) displayed her versatility. The talented forward scored inside and out, hitting a pair of threes in her 14-point outing. Adams has the size and skill to play 1-5 during the high school season. 2020 6-0 F Sophia Singer (Woodstock) provided a major spark off the bench, hitting two threes during a stretch in the first half that gave Team Slink the lead for good. She scored all 9 of her points in the half and grabbed 3 rebounds. 2019 5-10 W Markiema Lancaster (Northview) came out of the gates hot for the Lady Rebels, brining intensity on defense and a slashing mindset on offense. She picked up 8 points, 2 rebounds, 3 assists and 3 steals. Quick and versatile, Lancaster is capable of defending multiple positions while able to help facilitate on offense. 2021 6-4 F Jillian Hollingshead (Holy Innocents’) finished with 9 points, 7 rebounds, 1 assists and 1 block. With a major size advantage, Hollingshead strayed away from the paint and instead handled guard duties. Her ball handling was impressive for her size, able to get to the bucket on occasion, but I felt like she could have been more effective down low. I would like to see her work inside-out instead of outside-in with her exceptional length. Her quickness as a face-up post presence could be a matchup nightmare but instead she started her touches catching at the three-point line. Long term, having those guard skills at that age and at that height make Hollingshead a future High Major prospect. Clemson, Minnesota, VCU, Western Kentucky, UIC, Western Carolina, Detroit-Mercy, Old Dominion and Ohio were a few of the schools in attendance for the Lady Rebels’ 50-47 loss to Michigan Storm Elite Taylor. 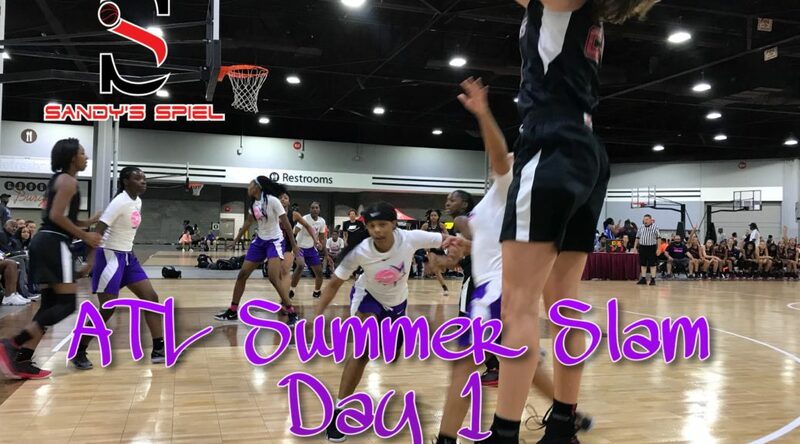 2021 5-5 CG Mariah Baltierra (Norcross) didn’t make the biggest dent in the score book, but her feel for the game and her decision making caught my eye. Baltierra came off the bench and provided important minutes in the Rebels’ 57-44 victory. Her IQ was apparent as she was always willing to make the extra pass and was able to probe the defense until she found something her or a teammate liked. She had 6 points, 1 rebound, 1 assist and 1 steal. 2019 6-4 W Riley Costas (St. Pius X) turned heads with his effort and scoring touch for God’s Property. Costas was Johnny on the spot, always in the right place at the right time. The lefty scored on nifty drives and jumpers extending out to the three-point line. To no surprise, he brought his MTXE mentality equipped from the high school season to the travel ball circuit, willing to draw charges and make hustle plays. He had 22 points in a 73-67 win over Team Power and scored 11 points in a tight championship loss. 2019 6-5 F Jaylen Bates (North Atlanta) is a powerful forward that brings his football toughness onto the hardwood. Bates is a physical presence in the paint with a quick explosion when attacking rebounds. His play was consistent and integral in helping the GA Elite Ballers capture the 17U Blue Championship. Throughout the tournament Bates had games of 10 points, 9 rebounds and 2 blocks and 13 points and 5 rebounds. In the championship with the Baller bigs battling foul trouble, Bates turned in 10 points, 2 rebounds and 2 steals. After averaging just 3.6 points and 2.8 rebounds as a junior, Bates is a huge reason why North Atlanta will be a favorite in Region 7-AAAAAA and a serious threat to take a deep run in the state playoffs. It’s time for 2019 6-1 PG Mitch Ganote (Lambert) to get his due as being one of the toughest guards in the state of Georgia. Ganote has proven to be a habitual winner with the GA Elite Ballers and Lambert, both in basketball and lacrosse having won a state title during the spring field season. Ganote is one of the craftiest ball handlers in the state with some of the best court vision in the 2019 class. Ganote was the engine that made the GA Elite Ballers go. He punishes defenders that aren’t used to his style of play. He completely controls the tempo of the game, either igniting the fastbreak or slowing it down in the half court. Ganote uses his body to back down defenders like Mark Jackson back in the day. He loves getting to his right, shielding the ball and using a multitude of spins to get to where he wants to go, often finishing with a nifty scoop layup or drawing a foul. In the first round of bracket play, the Ballers defeated a chippy Carolina Pressure team 67-66 behind Ganote’s grit and guile. He posted 21 points – 17 in the second half – 8 rebounds, 4 assists and 1 steal while going 9-of-15 from the foul line. In the Blue Bracket semifinals, Ganote went for 13 points, 3 rebounds, 6 assists and 2 steals in a 69-49 rout. Saving his best for last with Ron Hunter (Georgia State HC), Brian Gregory (South Florida HC) and Josh Pastner (Georgia Tech HC) in attendance, Ganote put on a show in the title game, hanging 17 points – 13 in the second half – 7 rebounds, 7 assists and 1 steal in a 68-64 victory. Ganote has to be regarded as a legitimate D-I option for schools looking for a gritty floor general. 2019 6-7 F Mackenzie McFatten’s recruitment has skyrocketed since I took the four-hour drive down south in late January. The Coffee lanky lefty fueled Team Power from the interior with his ability to guard multiple positions and rebound out of area. College coaches were swooning over his skillset. McFatten showed the ability to score with his back-to-the-basket and hit the outside shot. He had 12 points, 8 rebounds and 1 block against the Greater NE GA Warriors and 8 points and 7 rebounds against God’s Property. Hype 2021 played up in the 16U Division and cruised to a 69-64 title over JSI Elite. 2021 6-5 F Cole Middleton (Pace Academy) has all the makings of becoming a powerhouse All-State big man. Middleton did it all. Scoring from the low block with great post moves, hitting baseline jumpers and showing off his handles as he attacked the rim from the three-point line until he bulled his way to wherever he wanted. He had 19 points, 9 rebounds, 1 assist and 5 blocks in the championship. Middleton is more than just a stationary lumbering big man. His agility was on full display with his diverse skillset. He picked up a handful of travel calls when wheeling and dealing his way to the basket. He will need to clean up his footwork a little bit, but Middleton looks like a big-time problem over the next three seasons in Class AAA under new head coach Sharman White. 2021 5-9 PG Sutton Smith (Denmark) had the ball on a string as he torched JSI Elite. The little lefty buried 5 threes but was more than just a one-trick pony. He had some devastating crossovers that freed him up and left defenders in the dust while he kissed two pretty floaters off the glass. Smith finished with 19 points, 2 rebounds, 5 assists and 1 steal. Smith has flash to his game with his passing and a quiet swagger. He will be the face of the Denmark program as they debut in Class AAAA. 2019 6-3 CG Kalen Williams (Lakeside-Evans) was up to his old tricks with Team Power, scoring in bunches. His unorthodoxed high-release jumper was locked in against God’s Property, drilling 5 three-pointers. At one point in the second half, Williams was unguardable. He hit four threes and no defender could stay in front of him. Williams got in the paint at ease and took over the game before Team Power ran out of steam and lost 73-67. Williams collected 6 rebounds and 2 assists to boot. Williams is a scoring-minded guard who has gotten better at not forcing shots and getting his teammates involved. 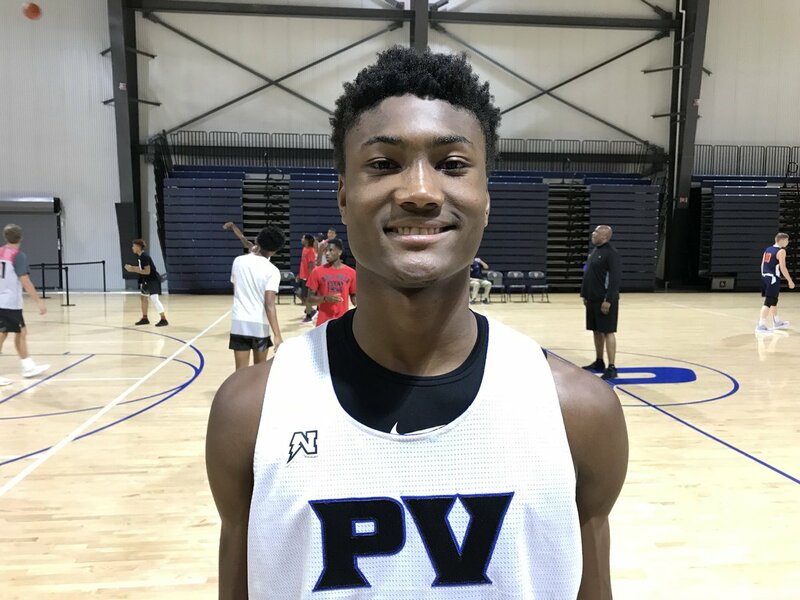 If Williams has his off the court issues behind him, he is a D-I level talent that could help a program looking for a tough competitor that knows how to get a bucket. The GA Elite Ballers won the 17U Blue Championship in thrilling fashion 68-64. Four players scored in double digits, but one who didn’t, played just as big a role in hoisting the trophy. 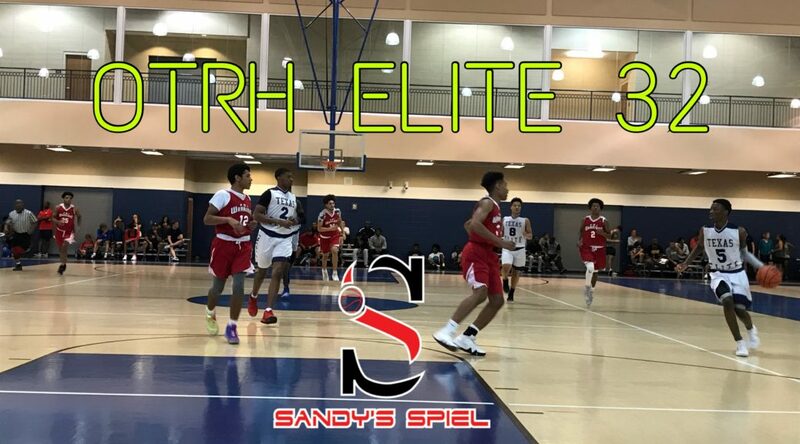 2019 6-4 SG Kalik Brooks (Alpharetta) drew the assignment of defending sharpshooter Devin Butts, who carried Team Georgia Magic to the title game by scorching the nets. Brooks made life for Butts difficult, staying in his chest as much as possible and holding the prolific shooter to 12 points. Brooks does the little things that don’t show up in the box score. He is accepting of his role of being a defensive-minded guard. Brooks can score when called upon, especially slashing to the basket, but he is content with doing the dirty work. His length allows him to guard multiple positions and he should be called on to be Alpharetta’s No. 1 perimeter defender his senior season. 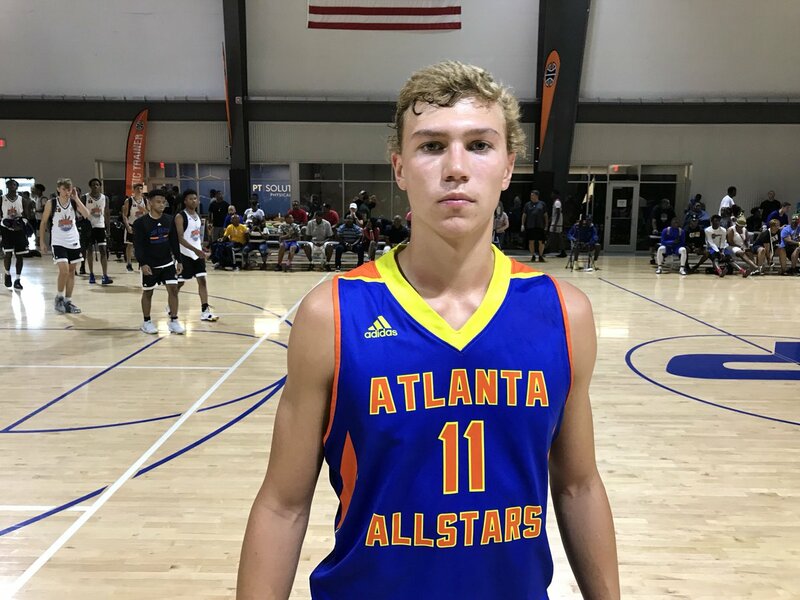 2019 6-4 SG Jaxon Etter (Etowah) and his uncanny ability to rise to the occasion on the biggest stage stole the show yet again in the Atlanta All-Stars’ 75-55 mercy rule of Team Georgia Magic. 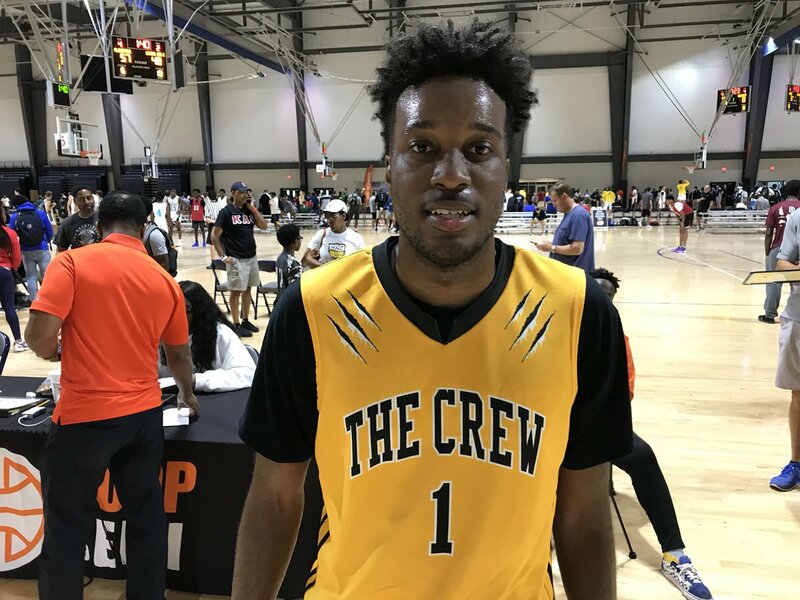 With a packed house of college coaches in attendance ranging from Young Harris to Georgia College to Georgia State to Cincinnati and many, many more, it was Etter who unleashed a 26-point barrage, drilling 6 threes to silence critics that question the consistency of his jumper. 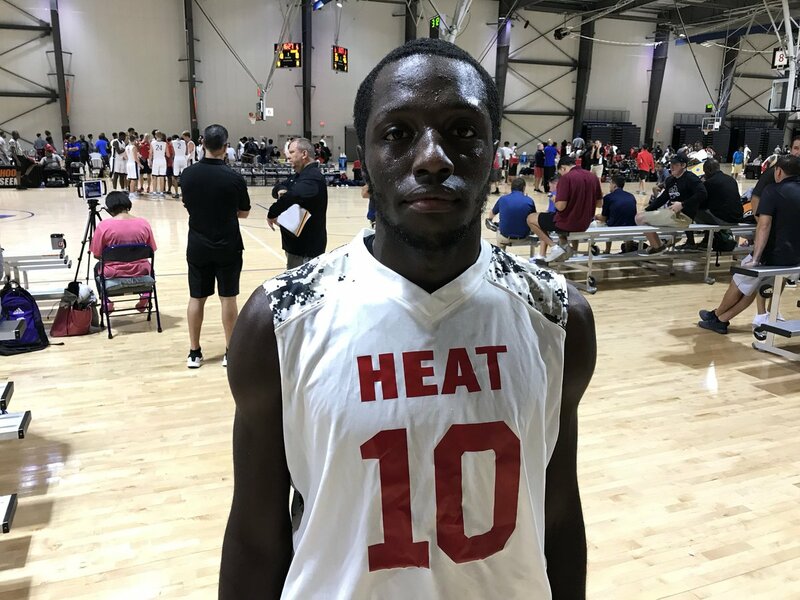 Not only did Etter carry the All-Stars from deep, he drew the assignment of defending red-hot prospect 2019 6-5 SG Devin Butts and held the sharpshooter to 6 points and a scoreless second half. No one quite knows what level Etter will land at, but performances like these continue to grow the mystique surrounding Cherokee County’s finest. 2019 5-10 PG Matt Gonzalo (St. Pius X) expertly orchestrated the Atlanta All-Stars with 12 points, 2 rebounds, 9 assists and 3 steals. Gonzalo’s jitterbug quickness and activity on defense kept the Magic from ever finding a flow in consecutive possession. Offensively, Gonzalo made all the right reads as he usually tends to do and sank two early threes to keep the defense honest. Middle Georgia Prep 2019 6-6 F Clarence Jackson brought great energy and effort – as he always does – in Team Georgia Magic’s loss to the Atlanta All-Stars. Jackson posted 16 points, 13 rebounds, 1 assist and 1 steal. His passion for the game shines through with his toughness and mindset to battle every possession. Coaches in attendance said they wouldn’t be surprised to see Jackson surface on a D-I roster in due time. 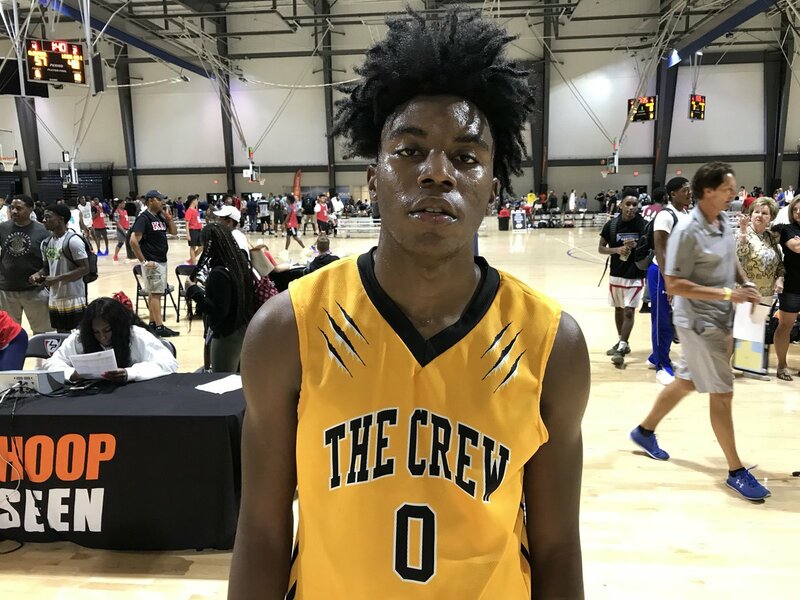 The 16U Georgia Stars backcourt of 2020 6-2 PG Christian Wright (Milton) and 2019 6-4 SG Nahiem Alleyne (Mountain View) drew a bevy of High Major head coaches throughout the day. The early start time at 8 AM didn’t affect the duo in an 83-57 route of Team Parsons North Florida. Wright had 18 points, 4 assists and 2 steals. Alleyne posted 17 points, 4 assists and 3 steals. 2018 6-4 W Marlon Lewis (Morrow) stood out in a Georgia Heat loss. The available senior that was a First Team All-Region 3-AAAAA performer turned in 19 points, 10 rebounds, 1 assist and 1 steal. Lewis knocked down three deep balls and showcased nice athleticism. He averaged 14.5 points and 5.3 rebounds his senior season. He could be a nice late pick up at the lower levels. Team ProVision showcased the type of small school guys that are a pleasure to discover. Friday afforded us the opportunity to see 2020 6-8 F Tyrese Powers (Fitzgerald) for the first time. The long lefty showed flashes of D-I level ability in his first impression, finishing with 13 points, 7 rebounds, 1 steal and 2 blocks. Powers runs the floor well and can play positions 3 through 5. His jump shot extended out to 17-feet with the threat of a three-point shot possibly growing into his arsenal over the next two seasons. He could end up developing into a Rashun Williams type prospect if he decides to put more time into his perimeter training than his post game. Powers should have a monster season in South Georgia. ProVision flaunted another blossoming big in 2020 6-8 C Amaree McGriff (Lanier County). McGriff is a good athlete with long arms and a knack for blocking shots. The defensive minded post had 7 points, 10 rebounds, 1 steal and 3 blocks on Friday after tallying the exact same stat line: 7-10-1-3 the night before. McGriff doesn’t have a ton of back-to-the-basket post moves right now, but he is involved in every carom off the rim and if he gets two hands on it, you can be sure that he will try to power back up with a dunk. McGriff has a tendency to have bad body langue at times. When he is engaged and doesn’t worry about a lack of post touches or calls not going his way, he is an extremely effective player at the Class A-Public level and currently an interesting D-2/JUCO caliber player due to his size and mobility. 2019 5-10 G Keandre Graham (Early County) impressed with his marksmanship from deep beyond the arc. The spunky shooter caught fire, hitting five threes en route to 21 points, 4 rebounds, 5 assists and 1 steal in a win over the College Park Rim Rockers. Graham is tough to corral in the half court with his ability to stretch the floor and then create for teammates. 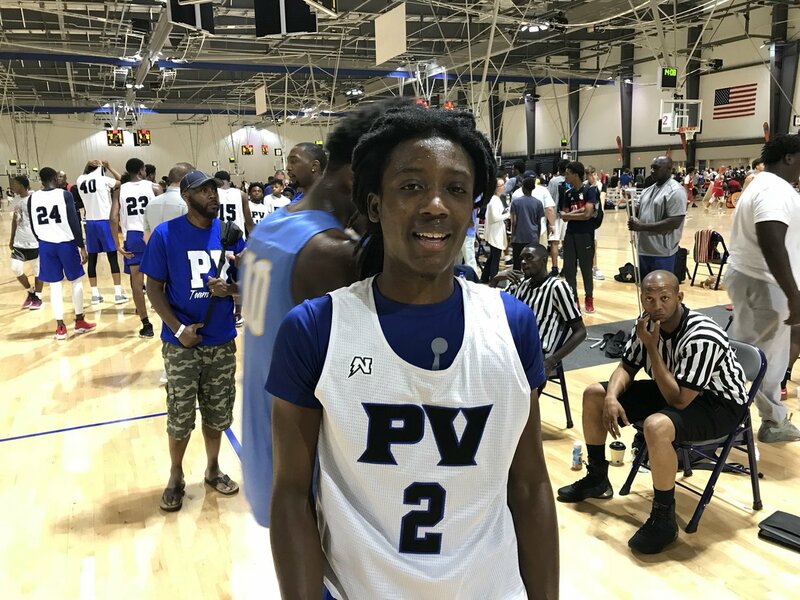 ProVision had steady contributions from Middle Georgia Prep bound 6-1 SG Stantravious Smith (Sherwood Christian Academy). The GICAA scoring maestro averaged 29.1 points per game as a junior before finishing his career going for 34.4 points, 11 rebounds, 2.3 assists, 2 steals and 1.7 blocks on average. On Friday he dumped in a fine all-around game with 14 points (3 threes), 5 rebounds, 4 assists and 2 steals. Thursday night, he tacked on 14 points, 4 rebounds and 3 steals. The 2019 Rebels saw the dynamic Bradwell Institute duo do the heavy lifting in two nightcap wins. 6-5 W Javonte Lecounte and 6-4 W Isaiah Scott flourished under Coach Simon Steele. Lecounte had 22 points, 11 rebounds, 5 assists, 2 steals and 1 block in an 85-73 win over Team SC Red before scoring 21 points vs. Pro One Select Grey. Scott stuffed the stat sheet as well, finishing with 16 points, 8 rebounds, 7 assists and 2 steals at 4:10 PM then exploding for 30 points at 8:50. If you’re a fan of big guards, Lecounte and Scott fit the mold as off-ball options. Lecounte is a strong downhill finisher. 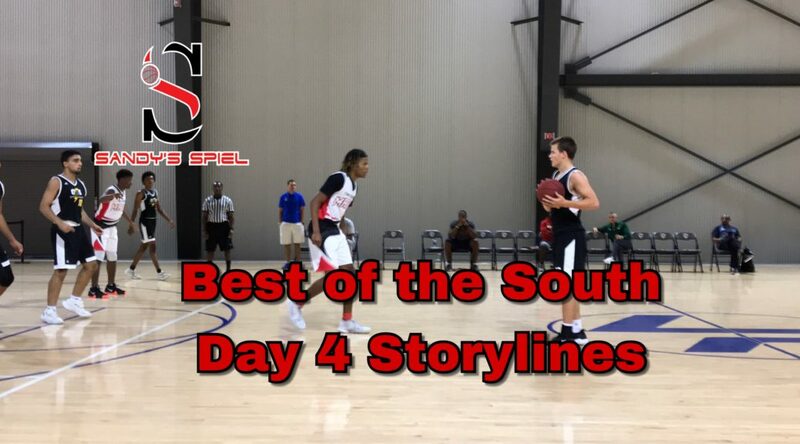 Scott has packed on muscle to his wiry frame and can score within the arc in a variety of ways, highlighted by a poster And-1 dunk against Team SC Red. The Atlanta Timberwolves buried 12 threes in a big 85-74 win over the Nike Elite Stars. 2019 6-4 F Jon Morgan (Combine Academy) dropped in 20 points, drilling three threes to open with before using his supreme athleticism to get to the basket. The recent LaFayette graduate collected 4 rebounds, 3 assists and 3 blocks as well. Morgan has turned himself from just a nice North Georgia player into a statewide known producer and a national prospect. 2019 6-7 F Austin Sloan (Houston County) had 18 points, 9 rebounds, 1 assist and 1 block. Sloan, much like Morgan, is an explosive athlete that bounces high above the rim. His leaping ability helps him score around the basket. Sloan’s range extends close to the three-point line with a high release point. He still needs to get stronger to survive the rigors of a long grinding season. His post physicality and defense can improve. Sloan can block shots but working on his stationary defending and preventing deep post catches will be an area to focus on. 2020 6-2 G Jack Kostel (Mill Creek) has nice size, sharp mechanics and some wiggle in his game. He tossed in 12 points, 8 rebounds and 4 assists. Kostel sank two three-pointers and did the rest of his damage getting to the foul line, going 6-of-8. Kostel looks like a very nice option come his senior season as he continues to progress. 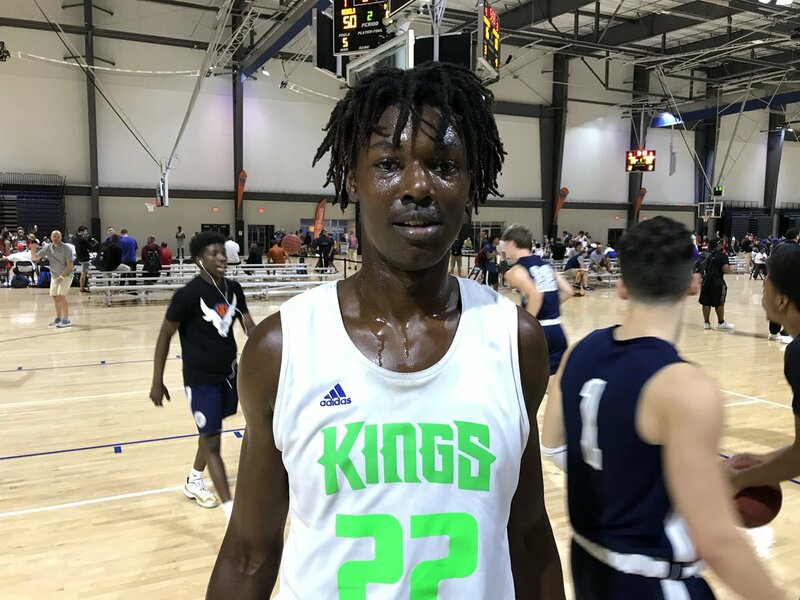 The human microwave, 2019 6-0 PG DaMarcus Johnson (Tri-Cities) pumped in 23 points, 4 rebounds, 2 assists and 6 steals in a loss to the Georgia Kings. Johnson hit 5 three-pointers, scoring 18 in the second half. Johnson is wired to score. I would like to see him stay aggressive throughout the course of the game. He can be a 20-point scorer and may need to be for Tri-Cities to repeat the success they had last season. As good of a scorer as Johnson is, give him credit for trying to stay true to his point guard position and rarely forcing bad shots. Johnson is content to get his in the flow of the game instead of constantly being on the hunt to find points. 2019 6-6 F Zeff Felton (Dooly County) is a great sleeper in South Georgia. After growing two more inches since the end of last season, the double-double machine is primed to breakout. While he may not ever average 20 points per game, Felton knows where his strengths are: provide energy and attack the glass. Felton averaged 11.3 points, 11.1 rebounds and 2.4 blocks as a junior. You can pencil him in to average another double-double. Felton is always crashing the boards and has a quick second leap to clean up misses. Felton should be a collegiate player. It’s up to him to determine what level. The best bounce in Georgia? It hands down belongs 2019 6-2 SG AJ Jackson of Westover. Jackson transfers in for his senior year and will bring toughness from Father Lopez High School in Daytona Beach. Jackson is the state’s best dunker and easily possesses a vertical over 40 inches. He has provided highlights all summer long with Georgia South. 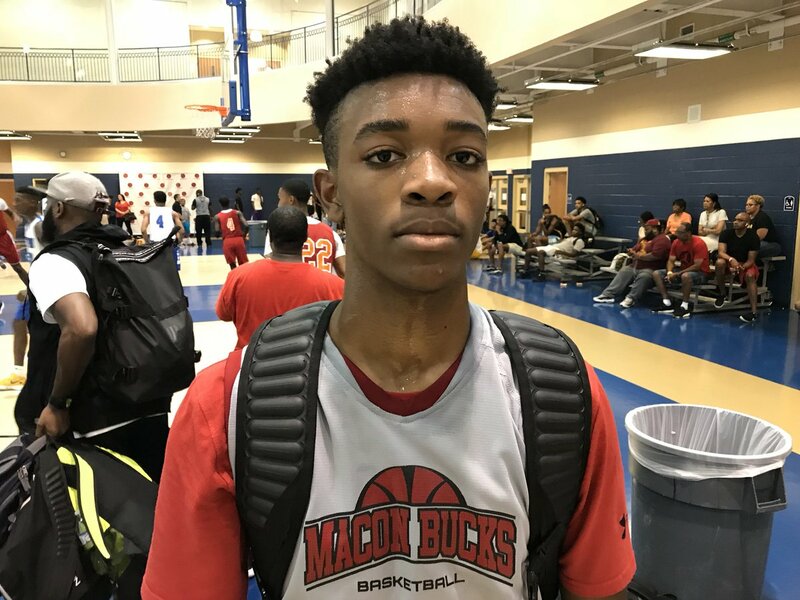 The Macon Bucks were led by 2019 6-1 PG Darius Dunn (Northeast-Macon) and 2019 6-5 W Jordan Stephens (Rutland). Dunn, a known commodity in Class AA, averaged 15.8 points per game as a junior and has a 16.4 career average as a three-year starter. He pumped in 15 points and 11 rebounds as a sparkplug. Stephens’ mix of size and diverse skill was intriguing. He produced 16 points (2 threes), 6 rebounds, 3 assists and 7 blocks. Stephens drifts from position to position, playing anywhere from 2 through 5 with the Bucks. His versatility, activity defensively and his court vision makes him a next level option for Non-D-I’s. The trio of seniors Jordan Brown, Mike Isler and AJ Jackson is going to win Westover a lot of games in Class AAAA. They might be ready to take a run into the Final 4. Brown’s three-point shooting, Isler’s all-around hustle and rebounding along with Jackson’s tenacious athleticism composes a strong core. 2019 6-3 SG Malik Battle (Alexander) is simply wired to score. He came off the bench for Infinite Skillz and was immediate offense, sinking two threes and finishing with 16 points. Battle is a great shooter from the mid-range and three-point line. He has performed like a future D-I player all offseason. Low-Majors and Mid-Majors will want a front row seat if they are looking for a fiery off guard that knows how to score. The Ballin Blazers backcourt of seniors Myles Todd (Pace Academy), Rodney Smith (Chamblee) and Darius Garcia (Shiloh) has been relentless this offseason. Todd and Smith have been efficient scorers. Both able to hit open jumpers and finish in the paint. Smith had 16 points, 3 rebounds and 1 block against the Georgia Canes while Todd added 15 points and 2 blocks. Garcia is an aggressive guard that can play bully ball with his gritty mindset. Not afraid to mix it up, Garcia had 6 points, 9 rebounds, 1 assist and 2 steals. Inside, the story of 6-8 C Solomon Ray (Grayson) continues to unfold. The defensive anchor had 6 rebounds and 4 blocks off the bench. Having played basketball for only one year, Ray’s defensive instincts are well above average. He should be a redshirt option for a Low Major/D-II looking for some long term defensive help.